Pago Pago (pronounced Pango Pango) is stunningly beautiful, so make sure you're on deck with your camera when your ship enters and leaves port. 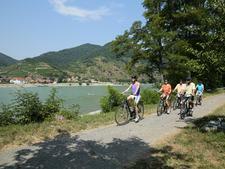 The town is located near the westernmost end of an L-shaped bay and is surrounded by lush, green mountains. Opposite Pago Pago on the eastern side of the bay is the mountain known as the Rainmaker, so-called because its top catches clouds that frequently douse the slopes below in rain. In fact, the entire island of Tutuila is beautiful, from the coral reefs offshore to the old-world rainforests and waterfalls lining the steep sides of its mountains. 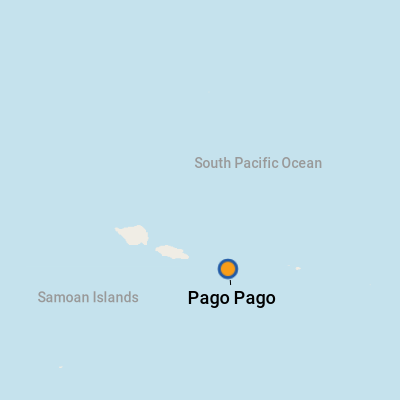 The capital of American Samoa, Pago Pago is located some 2,300 miles from New Zealand, 1,600 miles from Hawaii and 14 degrees south of the equator. American Samoa is home for some 65,000 people, of whom around 9,000 live in Pago Pago. The Samoan islands have been inhabited since about 800 BC, when early Polynesians first landed near the current day village of Tula. 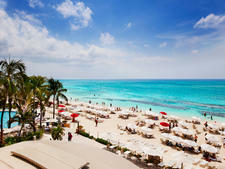 Europeans didn't get even a glimpse of these tropical shores until 1722. Today the islands are divided into the independent Kingdom of Samoa and American Samoa, which is a non-incorporated territory under U.S. sovereignty. American Samoa retains much of its traditional way of life, called the Fa'a Samoa, in which the head of the extended family enjoys great respect. Villages have fale, guest houses that look like large gazebos, where people entertain visitors. The higher the fale, the higher the status of its owner. Religion also plays a major role in the life on the islands, and you will see many churches on Tutuila. More a cruise destination that's limited to genuinely exotic itineraries, such as world cruises or repositionings between Australia/New Zealand and the North American West Coast; although there is an airport with regular flights to Hawaii, Pago Pago is truly an off-the-beaten-track destination with a limited number of restaurants and other tourist services. The town itself is small and quiet. Houses have been built on the steep hills not far from the seafront, and most of the shops line the street that runs in front of the dock itself. One plus is you'll never have to venture even that far to start shopping -- locals will come in strength to the dock to present their merchandise and crafts. If you want to see more of the island's natural beauty or experience some unique local customs, it's best to take a tour. And don't think your day exploring Pago Pago's natural wonders ends when you board your ship. The waters off the island are a mecca for marine life. Southern humpback whales winter here between August and November, and porpoises and sperm whales visit regularly. 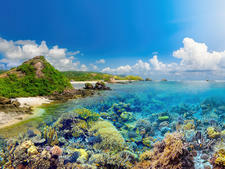 Various species of marine turtles call these waters home. If you stay on deck as your ship departs, you may see several whales swimming in a group alongside the ship. And that might just be the most fitting farewell to this beautiful yet remote destination. Cruise ships dock right in the center of the town, next to a busy container dock. Pago Pago is a very small town, so everything is close by. For the closest possible shopping option, look for the many stalls selling souvenirs on the quayside. It rains an awful lot here, so bear this in mind when venturing ashore. Although it's a warm rain, a true downpour may soak you with little advance warning. Also, due to the strong role of religion in the community, women are advised not to wear shorts when visiting the countryside. With a population of just 9,000, Pago Pago is a compact place, and you can walk the length of the town as it follows the seafront for a bit more than a mile. The town is surrounded by steep hills just a few hundred yards from the waters' edge, so the inland area gets narrower the farther you go from shore. For those who'd rather not walk, local buses, which are built on large pickup trucks, will take you from the town center to anywhere you want to go for $1. Especially short trips cost only 50 cents. To explore the island on your own, consider renting a car. Avis (tel 684-699-2746) is the only international chain. Friendly Car Rental (tel 684-699-7186; open Monday - Friday 8 a.m. - 4 p.m.) offers a variety of cars from sedans to 15-passenger vans and SUVs. Sadie's Rental Cars is open 24/7 (tel 633-5981). The U.S. dollar. The nearest ATM is at the ANZ American Samoa Bank at Pago Plaza in the town center. Most of the restaurants in Pago Pago are American in style -- after all, you are technically in the United States -- with a decent dose of local color in decor and menu. The town does not have many restaurants, but of the few choices available, most open for breakfast around 7 a.m. and close after lunch at about 2:30 p.m. One notable exception is the Don't Drink the Water Café on Pago Plaza, which remains open until 12:30 a.m. on Saturdays (and don't be alarmed by the name -- you can safely drink any beverage served in this eatery). One of the best places in town is the Sadie Thomson Inn (633-5981), on the main street by the waterfront. Located in a green building some half a mile from the quay (turn right at the dock gate), it offers a lively bar and a restaurant. The bar meals change daily, but you always have a choice of four mains, two of which are fish. The restaurant offers an a la carte menu for lunch (served 11 a.m. to 3 p.m.). The ham and veggie soup ($6) is pleasantly full of carrots, peas, onions and cabbage. Aki Mignon ($16) -- essentially tuna with fried bacon -- is served with fried rice, sprouts and a sauce. Medium rare, it was excellent -- not surprising, given that the fishing boats dock just across the road. The service was quick and friendly, and the place itself was clean and pleasant in modern, simple style. Local handicrafts and textiles, such as wood carvings or handbags made by weaving together leaves of the Pandanus plant.